Mitchell Starc wasted all four new balls in this first Test against India and has now averaged 49 with the ball in his last five matches, casting doubt over his position in the Australian side. The gifted left-armer has never traded on accuracy but in this Test he has sprayed the ball in a manner rarely seen from a regular Test bowler. So out of sync was Starc in the second innings yesterday that he conceded an extraordinary 16 byes from wild deliveries which wicketkeeper Tim Paine could not get a glove on. While Australia’s faltering batting lineup is their biggest concern at present, the pressure released when Starc has taken the ball has been a key factor in India taking control of this Test. I cannot remember the last time a bowler’s figures were more misleading than Starc’s match return of 5 for 103. Three of his wickets were tail-enders, with his two top-order scalps being gifts from Indian opener Murali Vijay, who twice edged behind from Starc with airy drives. India’s out-of-form opening pair is the biggest weakness in their lineup, offering Australia a potential early look at the tourists’ two key batsmen – Cheteshwar Pujara and Virat Kohli. But to get that early look, Australia have to make the most of the new ball. Right now, Starc is butchering that opportunity. He was far too wayward with the first, second and third new balls Australia accessed in this Test. Then Starc’s new-ball performances reached a nadir yesterday when he was dragged by captain Tim Paine after just two rank overs with the second new ball. There is no need for me to describe in detail how bad that brief spell was when you can just look at this graphic from cricket analytics firm CricViz. 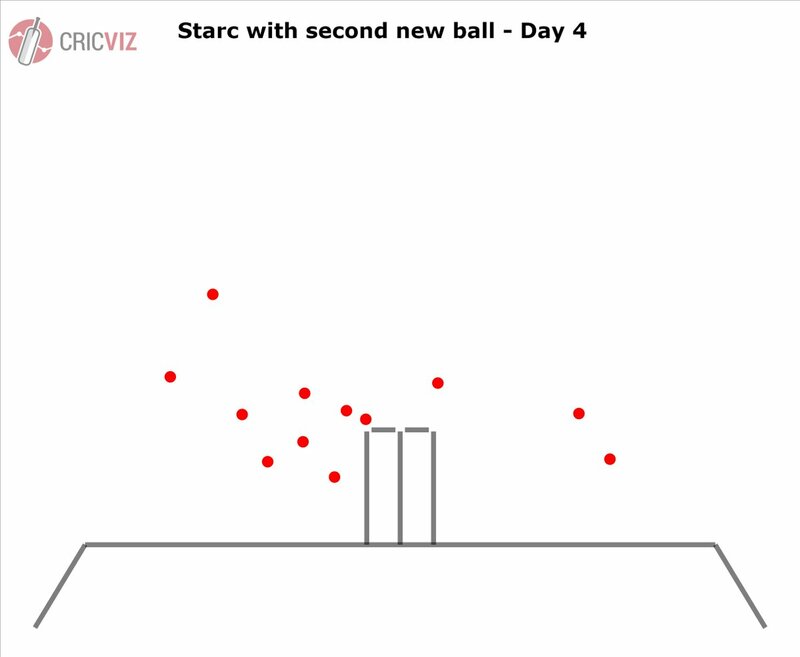 The most worrying thing about that graphic is that it’s not an anomaly – Starc has regularly been this loose, or at least close to it, with the new ball in Tests this year. Granted, he has never been an uber-reliable new ball bowler, one who makes the most of it more often than not like his long-time pace sidekick Josh Hazlewood. But he has not been this consistently erratic since early in his Test career. Back then, Starc had excuses for his imprecision. Firstly, he was a tearaway quick in his early 20s, the style of bowler from whom you cannot reasonably expect great consistency. Secondly, he was never given a chance to settle in the Australian team and find his feet at Test level. The most bizarre statistic of Starc’s Test career is that his first 14 Tests were split up across ten separate stints in the Australian team. Again and again he came into the team for one solitary Test before being dropped, rested or injured. When finally in 2015, more than three years after his debut, Starc was given a proper run at Test cricket, he made massive strides. From the start of that year up until the end of the first Test in South Africa this year, Starc’s Test numbers were incredible. In that time he took 134 wickets at 23. His strike rate was a blistering 42 and he averaged five wickets per Test. They are the numbers of a great Test bowler. In that aforementioned first Test in South Africa, Starc was Man of the Match, grabbing nine wickets for the Test as Australia comfortably defeated the Proteas. Since then, however, he has lost his way. In the next two matches against the Proteas, he took a combined 3-294 on pitches which were good for fast bowling. His following two Tests were against Pakistan in the UAE where he looked threatening during some spells but pedestrian in many others. In between those two Test series he had a long layoff due to a bone stress reaction in his right leg. But he’s now been back in action for more than two months. Whether his body is hindering his bowling right now I do not know, but what is not in doubt is that he looks bereft of rhythm and confidence. If Australia lose this first Test – and that looks extremely likely – then the Border-Gavaskar Trophy will be on the line in the second match at Perth starting on Friday. 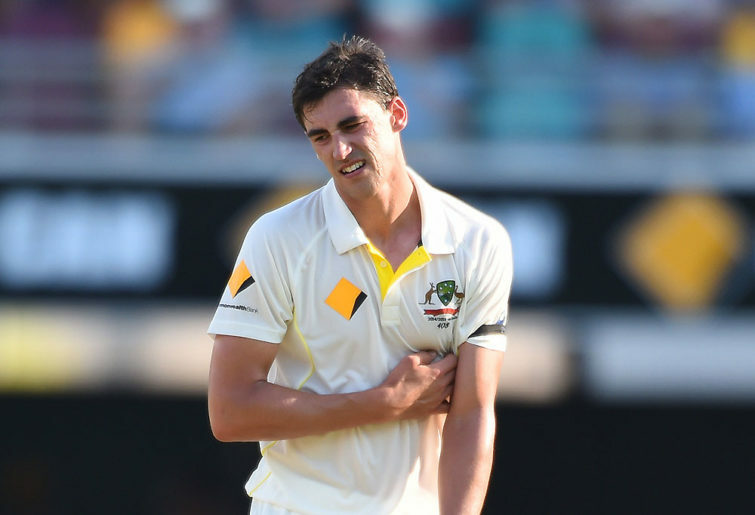 With only three rest days in between these Tests, Starc has very limited time to correct whatever is ailing him. Given the gravity of that match, Australia must seriously consider replacing him with in-form Victorian quick Chris Tremain. Tremain and veteran seamer Peter Siddle are the back-up pacemen in Australia’s squad. Of course, they don’t have to pick a bowler from their squad, they could pull a surprise by selecting a bolter like sharp young quick Jhye Richardson, who is in blazing form with 26 wickets at 18 in the Sheffield Shield. Or they could go for the safety-first option of picking the vastly experienced Siddle, who played in both Tests against Pakistan in the UAE alongside Starc. Siddle is, however, struggling for penetration these days. Across five first-class matches in the past two months, he has taken just 13 wickets at 35, including three wickets at 56 in the Tests against Pakistan. In the Shield last summer, Siddle took 24 wickets at an average of 40, while his Victorian teammate Tremain ran amok with 51 wickets at 21. 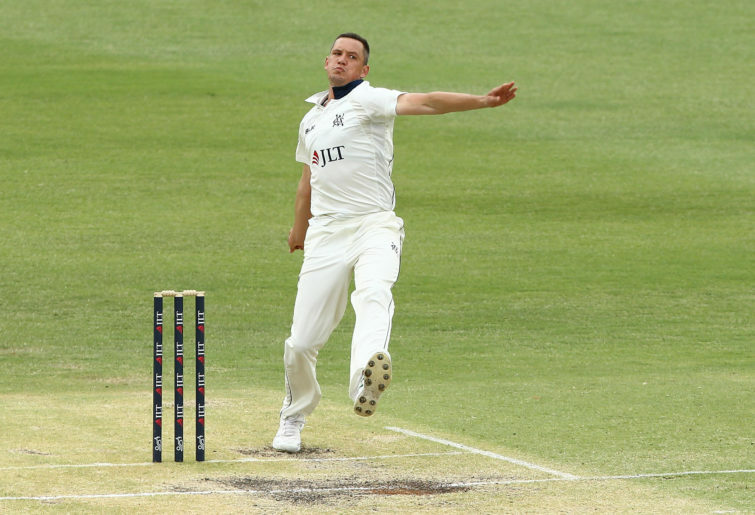 Tremain is dominating the Shield again this summer, with 27 wickets at 22, bringing his tally across the past four Shield seasons to 155 wickets at 21. The selectors erred by not handing him a Test debut in the UAE, which would have left him better prepared to play a role in this blockbuster series against India. Regardless, at 27 years old, with no injury concerns and in the form of his career, Tremain surely is ready for such a challenge. The selectors will be understandably reluctant to drop Starc considering what a hugely valuable player he has been over the past four years. But right now he is dragging down Australia’s attack, which is the only strength possessed by this cobbled-together Test unit.